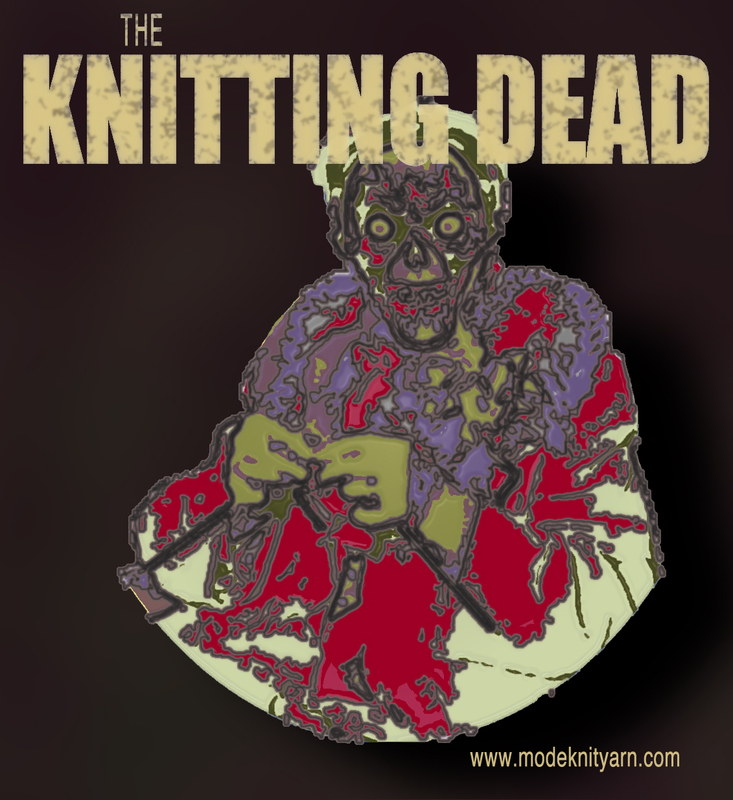 I’m not a natural-born zombie lover, as many knitters seem to be. So It took me a while to settle into a love of The Walking Dead. My criteria for loving a TV show has—so far—been simple; No Sweaty Men. This one rule has kept me safe from many testosterone laden series and bad reality shows. But evidently I have overcome my rule and have come to love TWD. Who knew? I’m usually a Downton Abbey / TCM kind of woman. I think what swayed me toward TWD was the brilliant after-show, Talking Dead, which is hilarious and sweetly earnest, hosted by the incredibly charming Chris Hardwick (@nerdist on Twitter who also hosts @Midnight on Comedy Central after The Colbert Report M-Th.) Once I watched a few episodes of Talking Dead, I had to go back and see the entire Walking Dead from episode one. Lots of good knitting between the cringing and eye-gouging. So here I am, loving this gory, zombie laden, not-very-logical TV show (why on earth did they not just head to an island in Season 1?) where there’s barely enough water to drink, let alone have a full bath. One of my favorite scenes in the entire series is in episode 1, when Rick meets Morgan and Duane and takes them to the station house for a good, hot shower. Yep, I love me a good ‘make-over’ montage! Give me CLEAN any day! I’ll be creating these colors each week, so join me as I strive to find some wooly beauty in the gory details of The Walking Dead! And feel free to make suggestions, I’m all ears! This entry was posted in MKY, NO SPOILERS, TV Review, TWD and tagged Talking Dead, TWD by Annie. Bookmark the permalink.